Who would argue with that advice? Not me, not today. The stovetop refused to heat, it was w-a-a-y too hot to bake and I couldn't find the energy to walk to town for lunch or even an ice cream cone. 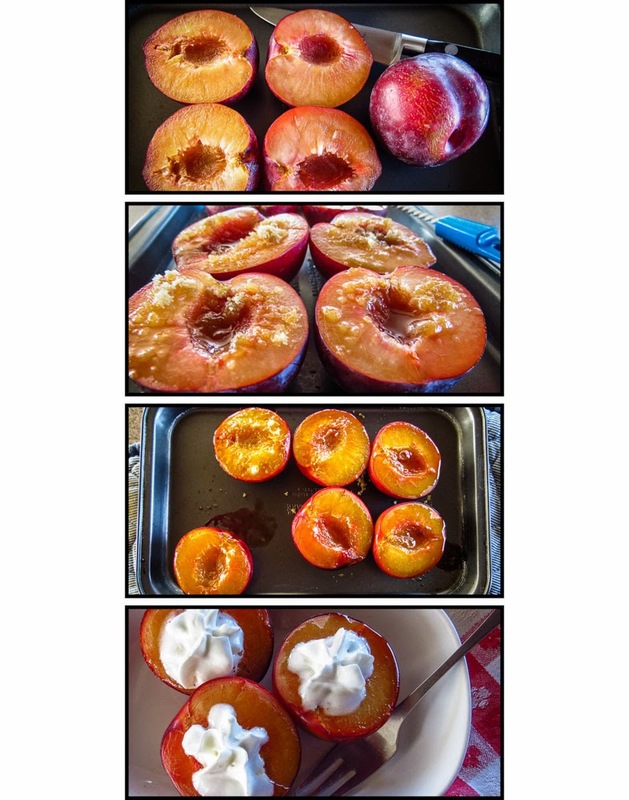 Broiled stone fruit to the rescue! I considered making Nutty Nectarines, but after checking the galley fruit basket, decided on a simple plum preparation instead. 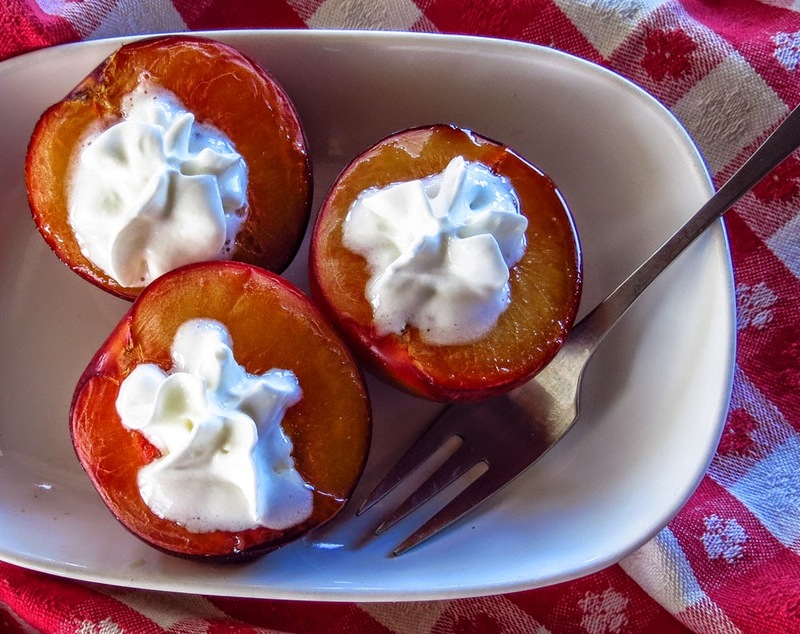 Just plain plums would have been an adequate snack, but brushed with Triple Sec, sprinkled with brown sugar, broiled and topped with whipped cream... well, after all that they were divine. I did contemplate using a torch to caramelize the sugar instead of heating up the broiler, but that seemed too dangerous on this hot, lazy day. Today was a day to enjoy a fresh-fruit treat, not to have a blazing adventure. Sweet but not too sweet, the melted sugar balanced the slightly tart edge of the red plums. Next time I might add a sprinkle of chopped nuts to up the crunch factor, almonds or pistachios would be my first choice. The broiled plum dish was a perfect snack, tempting enough to enjoy again as dessert as we relaxed on the boat deck, watching a dramatic neon sunset develop across the marina. Life is good... and so are Broiled Plums. 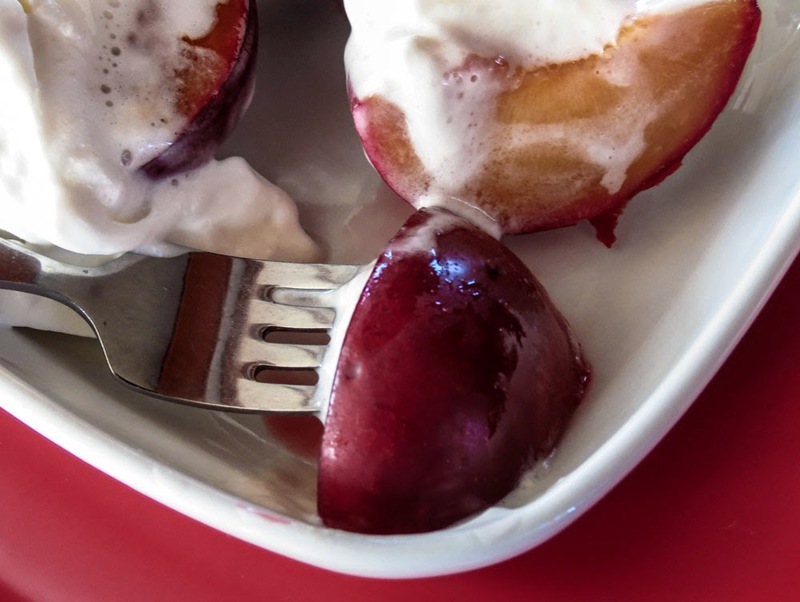 Place the halved plums in an oven-safe pan, cut side up. Brush the fruit with Triple Sec and sprinkle lightly with brown sugar. Preheat the boiler, setting the rack so the top of the fruit is about 6 inches below the flame or element. Place under the broiler and heat for 4 to 6 minutes, until the sugar is melted and shows some color. Eat it plain or serve with Honey Greek yogurt, crème fraiche, ice cream or whipped cream. 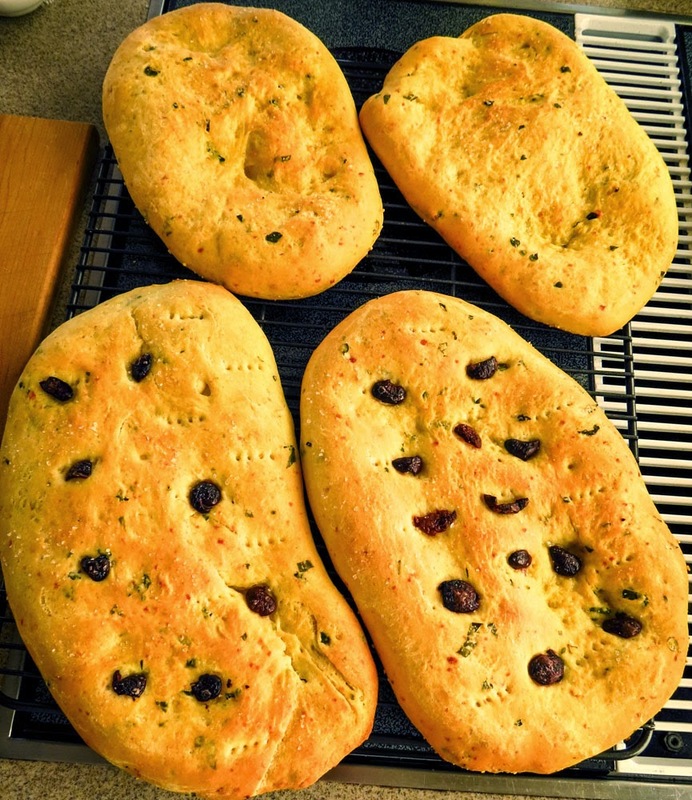 This flatbread recipe began with an unscheduled visit to the old Goose Bay Cannery in Rivers Inlet. The cannery ceased operation in 1957 but the building complex remained. 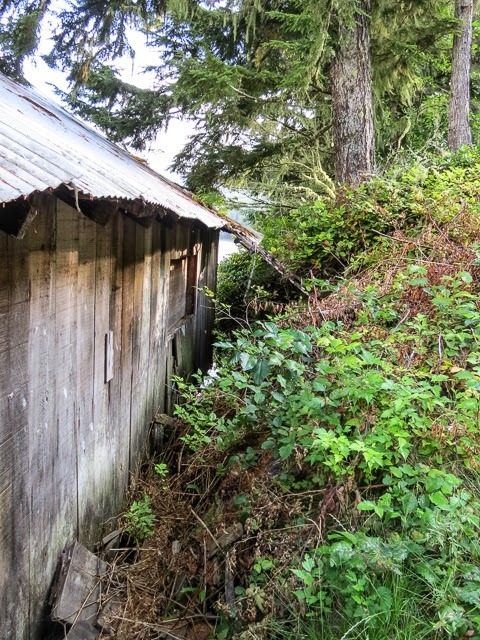 The site functioned as a fishing lodge for a period after that, but that venture closed and the site seemed destined to end up as just one more crumbling historic ruin. Enter a group of Burnaby, B.C. firemen who purchased the cannery ten years ago and have given the place a new life. Some Vancouver, B.C. firemen joined the group and I believe the ownership has now expanded to 27 members. The new owners undertook an impressive rescue and restoration project, both structural and cosmetic. 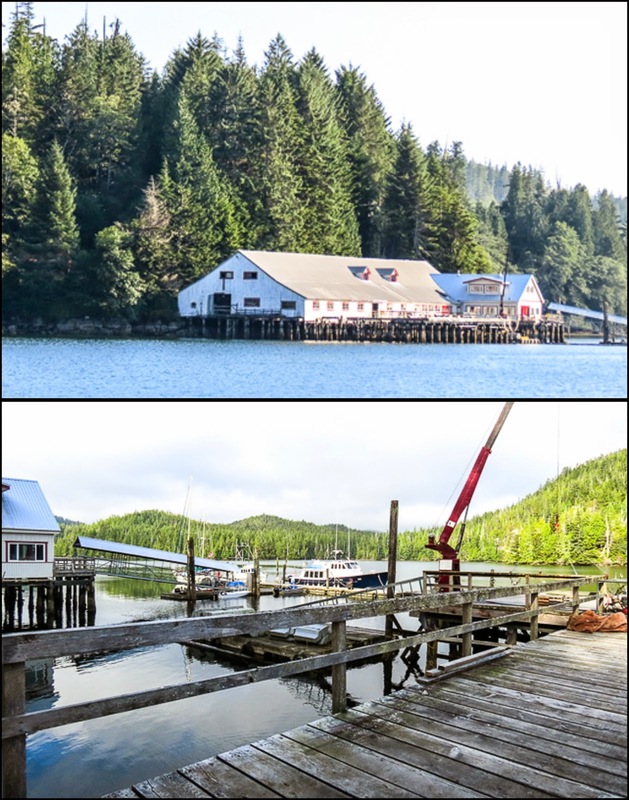 The visible exterior changes range from restored boardwalks, new piling, a covered ramp to a huge concrete floating dock, roofing and siding repair and fresh paint everywhere you look. The visible improvements barely hint at the energy and effort involved in restoring the cannery complex. We arrived at the site late in the day, an impromptu stop following a waterside photo shoot of the cannery. We accepted an invitation to tie up and tour the site (thank you, Ray and Tom) and join a group of visiting firemen and friends for dinner. My small taco salad-for-two was a puny contribution to the meal as we dined on scrumptious Firehouse lamb burgers, tiny red potatoes, fresh sweet corn and a giant Caesar salad. At least our box of red wine was a welcome last-minute addition to the menu. How could we say thank you for such generous sharing? - with a little home cooking, of course. The visiting firemen filled their day with fishing and hiking, and had their entire trip menu well planned in advance, though their meal schedule seemed more… well, random and spontaneous. Flatbread was a perfect choice since fresh bread works, either as an anytime appetizer or snack or accompanying a meal. Pull it apart, dip a chunk in olive oil and balsamic vinegar and it’s heavenly. Slather a sliced baton with butter if that’s your thing. Eat a wedge plain and let the flavorful herbs shine in every bite. Cut a square and slice it horizontally to use for a sturdy, flavorful Panini base. Try a savory bread pudding. The possibilities are endless. I formed four flatbreads using a basic pizza/focaccia dough recipe plus flavored olive oil and a bouquet of mixed herbs. Pitted Kalamata olives topped two of the loaves, an impulsive last-minute addition. We had to sample one loaf, ostensibly to check the timing and to taste-test before sharing. Success! The bread smelled heavenly, its fragrant aroma perfumed the galley and our entire end of the dock. As for the taste, well we ate the whole thing... slice by slice... one after another... until it was gone. No adjustments required on timing or ingredients. The three remaining loaves, still warm from the oven, were enthusiastically received by a few of the sailboat crew. As I walked away I heard them debating whether to enjoy them right away with a glass of wine, or wait and share them with the rest of the guys when they returned from fishing. We left the dock at dawn the next morning, before anyone else stirred, so I don’t know if the flatbread was a hit or a miss. I’ll assume the best; after all, who can resist fresh bread? At least I never saw any bread chunks floating in the saltwater. Update 3/30/2014: Rod (a dock neighbor at the Goose Bay Cannery) caught up with us in Campbell River and reported the flatbread was delicious with the guys' late night seafood chowder dinner, and greatly appreciated. I guess the herbs made it a hit, not a miss. In a mixing bowl, dissolve the yeast in the warm water. Add the sugar and the AP flour. Beat vigorously for 1 minute. Dough should be the consistency of a thick cake batter. Cover lightly with a damp tea towel and let rise in a warm spot until bubbles and lightens, usually 30 to 40 minutes. At the end of 30 minutes, stir dough and add the semolina flour, salt, and flavored olive oil. Mix well. Place dough on a floured surface and knead well for about 8 minutes, adding just enough additional AP flour as needed to keep dough from sticking. Form the dough into four balls. 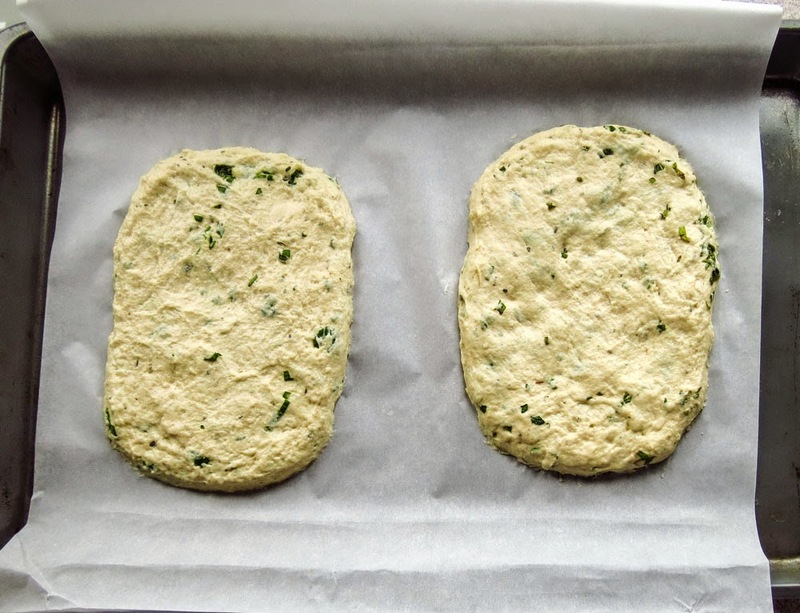 At this point, you can freeze the dough for later use or make it into flatbread immediately. Roll or press a dough ball into an oval about 1/2 inch thick. If dough resists, let it rest for a few seconds, then continue shaping. Each ball should make a 12-to-13 inch flatbread. Place on a parchment-lined baking sheet; brush lightly with seasoned olive oil and add any optional toppings. Prick here and there with a fork to minimize gas bubbles. Repeat with remaining dough balls - you will need a second prepared baking sheet. Let the loaves rest until dough lightens a bit. I have submitted this to #TwelveLoaves, my very last-minute link to recipes from an inspiring group of bakers who work with a different theme each month. 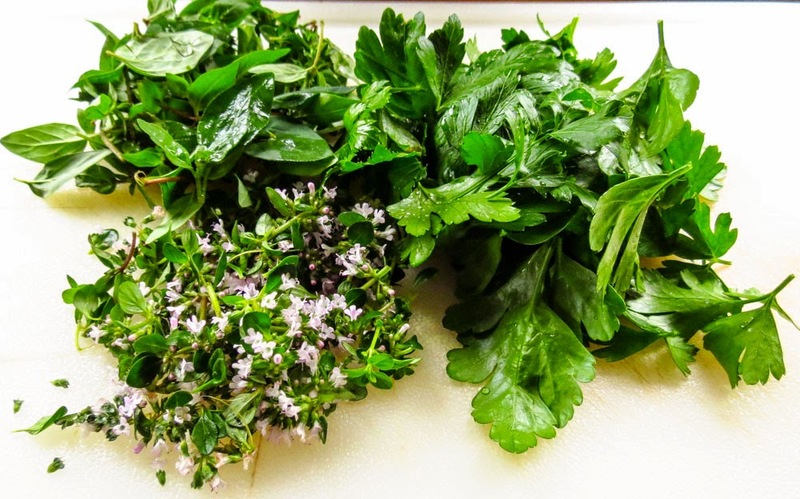 The August 2014 theme is Summer Herbs. This month our hostess is Sherron from Simply Gourmet. “Ferry boat food”. Does the phrase bring to mind crowds of passengers, all impatient and queued up in long lines, waiting to slide cafeteria trays down stainless steel ledges, ready to pick up bland, fast-food, carb-loaded meals? Ugh, not my thing. Well, adjust that image to include some new additions to the familiar fare of eggy breakfasts or lunches featuring burgers ‘n fries (poutine perhaps?). This recipe was inspired by a bowl of soup enjoyed on a trip between mainland British Columbia and Vancouver Island (Tsawassan to Nanaimo) earlier this year. Who would have thought that ferry food would ever be considered “inspiring”?! This soup was almost too good to share more than a taste with RL, but I relented and welcomed his ingredient analysis. This would be a tempting recipe challenge to work on during our travels afloat. While I don’t have the recipe for that original bowl of soup, this version scored high with taste testers in my galley. The various ingredients play nicely together, a surprise with some assertive items like ginger, cayenne, curry and garlic involved. No single flavor dominates, but they all have a role. 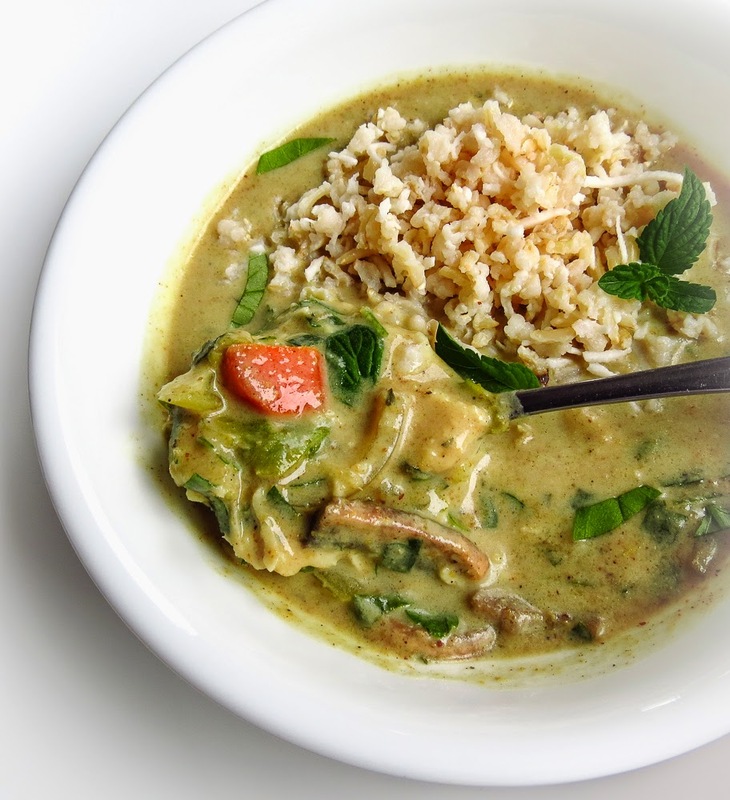 By itself the Chicken Coconut Curry Soup is delicious, but don’t skip the Coconut Rice – it makes the dish something special. 1. Cut the chicken into narrow slivers, roughly 1.5 to 2-inches long. Toss with cornstarch to coat completely; set aside. 2. In a large skillet, heat the oil and butter over medium-high heat. Add the chopped onion, celery and carrot and cook until the onion is translucent. 3. Stir in the Garam Masala, curry powder, cayenne pepper (if using) and ginger; stir for a minute or two until fragrant. 4. Add the honey, chicken stock and coconut milk and mix together until smooth. Cook for several minutes; taste and adjust seasonings. Lower the heat until the soup bubbles at a low simmer. 5. Add the cornstarch-coated chicken pieces and cook to just heat through but still moist and tender. The liquid will thicken slightly. 6. Ladle into bowls and top with green onions and shreds of parsley, basil and mint. Serve with Coconut Rice alongside, or spoon a mound of the rice into each bowl. Cook rice as indicated on packaging, substituting the ¼ cup coconut milk for ¼ cup of the water. 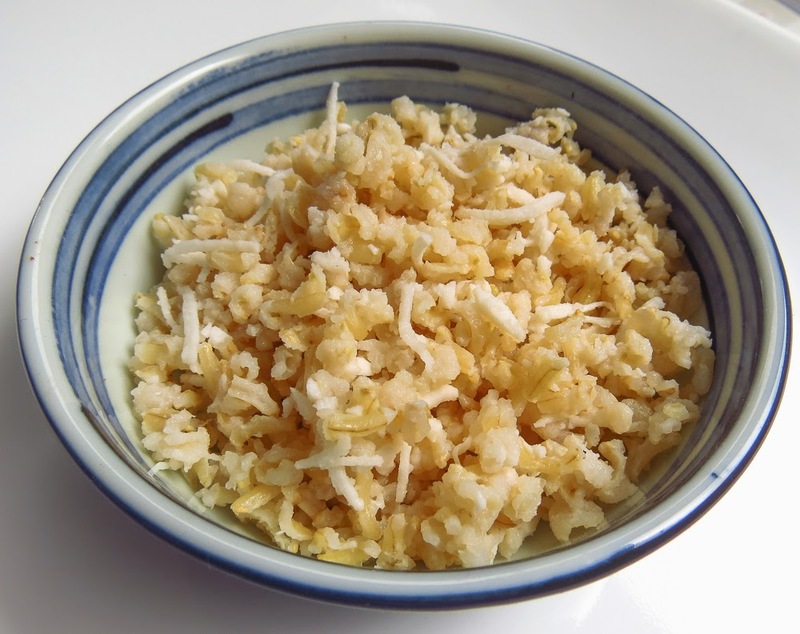 Add the shredded coconut at the end or cook it with the rice, either way works fine. You will have more rice than needed for the soup. I make extra on purpose to have some available for breakfast or a late night snack. Warm 1 part milk or coconut milk with a handful of raisins. Add 2 parts coconut rice plus a sprinkle of sugared cinnamon and heat or microwave to warm through. Scatter some slivered almonds on top and enjoy. Why was a small 2-pound frozen pork loin roast a problem? Don’t roll your eyes - I wanted the space for rolls of Cruising Cookie dough. You're laughing, right? Refrigerator/freezer space is an ongoing issue when we cruise. I need space for frozen vegetables, meat, poultry, etc. and a little ice cream to carry us through the weeks between towns and provisioning opportunities. The Capt. requires space for bait and fresh-caught seafood when we can’t consume the entire catch immediately. It becomes an interesting dialogue. Two pounds of pork were too much for a dinner for two, and the roast was only partially thawed. So I sliced off three chops to work with for dinner and put the still-frozen chunk back in the fridge to deal with tomorrow. Next I cut a small bouquet of sage from the overflowing herb pot and paused… now what? 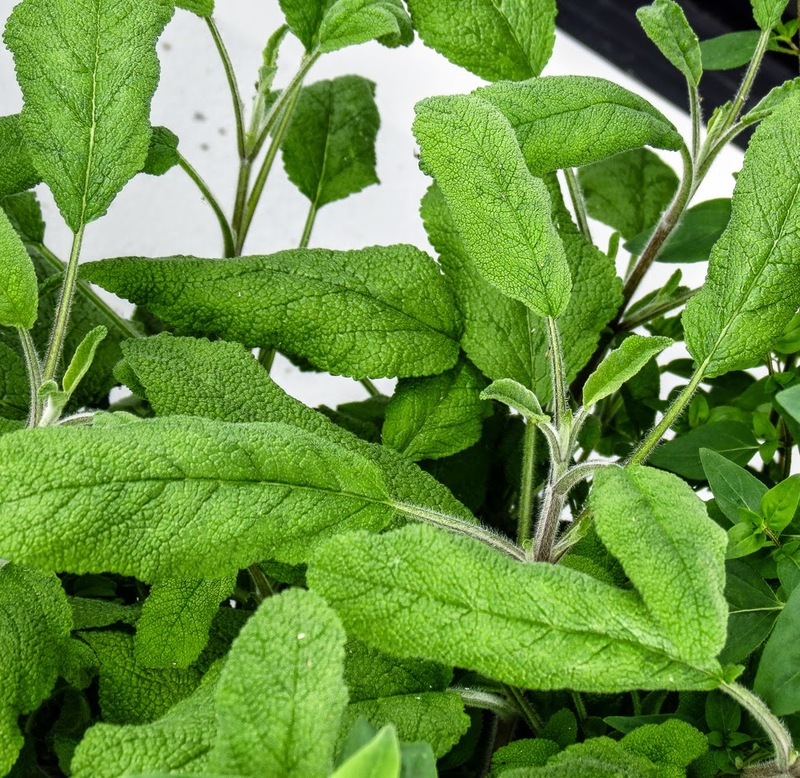 Sage has such an assertive presence I don’t use it often; it needs other strong flavors to tame it. Garlic, grainy mustard and lemon sounded good, and in the end they all came together better than anticipated. 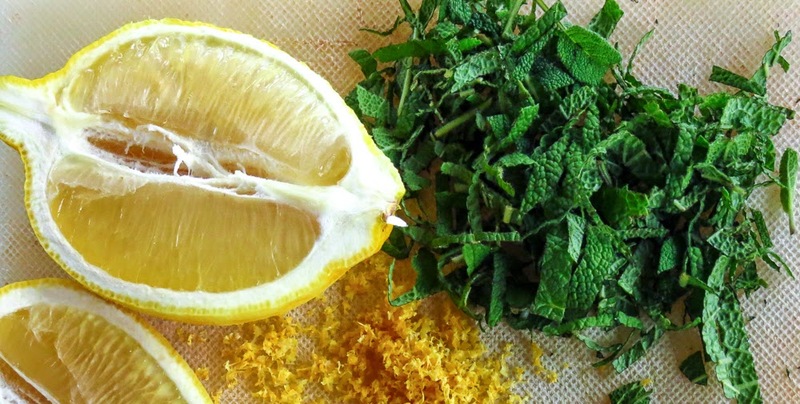 Sage and lemon are a tasty team, and the mustard and Parmesan add a terrific light crust. 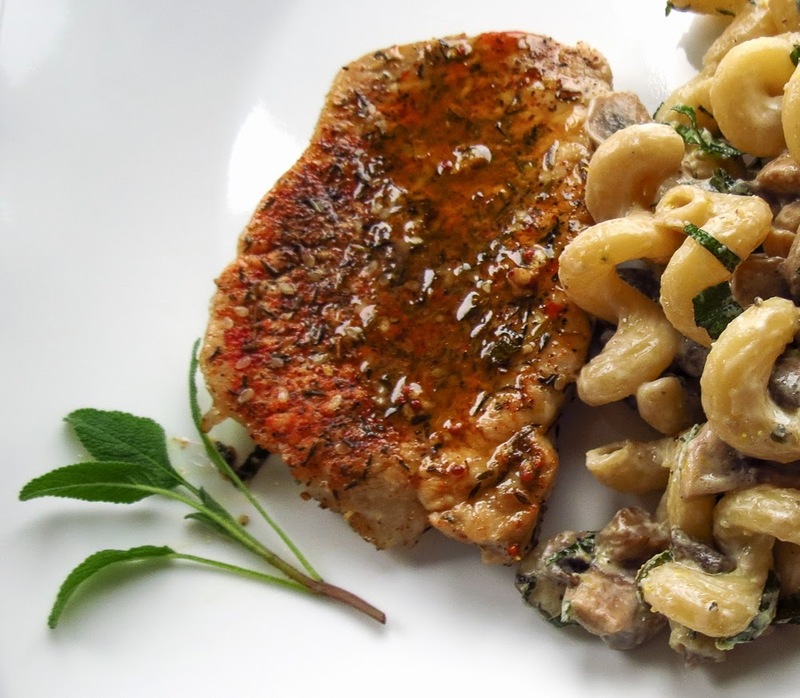 The sauce could be fancied up with marsala and cream instead of lemon, but we enjoyed the lighter approach. While I miss having a large in-ground garden, the herb pot has been great fun to work with once again. Sprinkle a small amount of water on a large sheet of plastic wrap. Place a steak on top of the plastic and sprinkle again with water. Cover with another sheet of plastic wrap and pound until about 1/4 inch thick. Repeat with the remaining 2 steaks. Lightly sprinkle the pork with salt, pepper and garlic powder. Spread one side with mustard, scatter half of the sage and cheese on top and press firmly to attach. Dust lightly with smokey paprika. Repeat on the second side. Heat the oil in a skillet over medium-high heat. Cook the pork until lightly browned on both sides but still quite pink in the middle, 2 minutes or less per side. Add the butter to the pan and and heat until melted. Add the lemon juice and half of the zest and cook, stirring constantly, until sauce ingredients blend and pork is barely pink in the center. Transfer to warmed serving plate and pour the pan juices over the top. Sprinkle with the remaining lemon zest, a scattering of shredded sage and additional salt and pepper as desired.